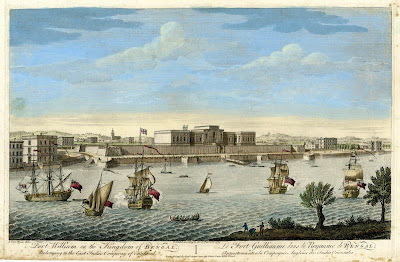 "Fort William in the Kingdom of Bengal," Robert Sayer, 1754, British Museum. 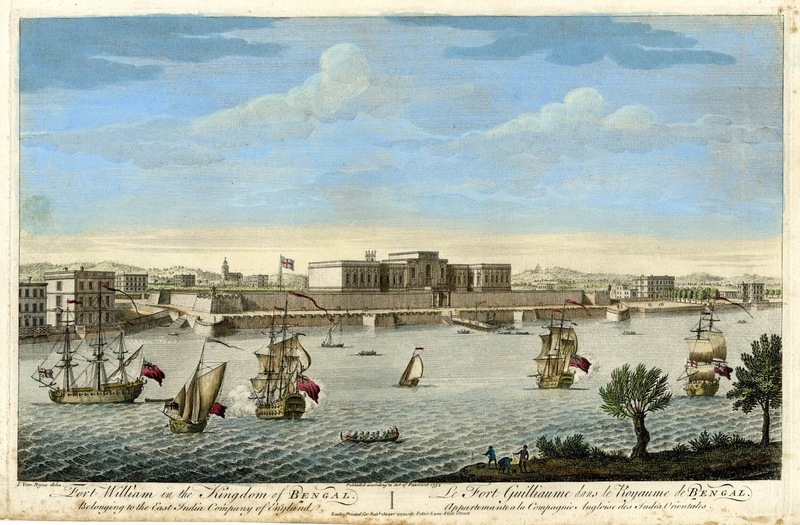 Robert Sayer treats his audience to an idealized view of Fort William in Calcutta. The fort we see here was completed in 1706, though portions of the fort had stood since 1696. Despite the best efforts of the British East India Company, Fort William was conquered only two years after this print was made by Siraj ud-Daulah, the last independent Nawab of Bengal. Siraj had many qualms with the East India Company, and Fort William was among them. When the Company reinforced and strengthened the fort without informed Siraj, it was taken as an act of aggression. In fact, the Company was warned to stop reinforcing, but refused, further angering the Nawab. Siraj took Fort William, but disorganization and miscommunication within the chain of command (and supposedly the cruelty of the few guards set to watch over them) locked the prisoners overnight in a remarkably overcrowded cell with virtually no water, lack of ventilation, and stifling heat. The conditions were so deplorable that a majority of prisoners died in the "Black Hole of Calcutta." Precise numbers are the subject of debate. Those atrocities were yet to come when Sayer printed this piece. The East India Company built, manned, and maintained Fort William in part to continue their dominance of the Indian trade. That makes it rather likely that the ships on the Hooghly River are East India Company vessels. All of them fly red ensigns, which could be flown either by Royal Navy vessels, or by merchantmen. The East India Company did have its own ensign, one of which can be seen in this piece from 1765. As I have seen on a couple of Indiamen, the red ensign could be flown by EIC ships. We should always be careful in identifying ships strictly on the colors they fly, as the use of ensigns that many vexillologists attribute strictly to naval vessels has been undermined in art. It may be that the artists are simply ignorant of the use of colors in the maritime world, or that these ships are actually flying ensigns we think of as belonging to one kind of vessel or another. 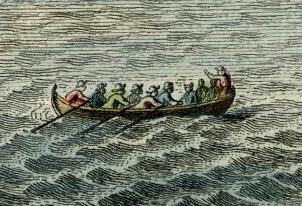 The men in this boat wear a variety of colored jackets: blue, green, and red. All of them wear round hats with varying lengths of brim.